I did a quick sketch of how I envision the scene at Brooke to look. I am shooting for a rural crossroads that grew into a small hamlet as the railroad arrived. The tavern will have a few out buildings such as a cook house and a well. The blacksmith will be based on an O scale kit I purchased. The first kit I plan to use in the layout, but I'll probably scratch build the structure. Gerry suggested a separate siding to the brick warehouse across from the tavern. The images of Culpepper and Warrenton show sidings like that. But I think that would imply a bigger town that I planned. I think with would also crowd the scene. It would add a bit of operational interest as it provides another siding for operators to switch. We'll have to see how this develops. The fence and army camps will help tie the scene together. 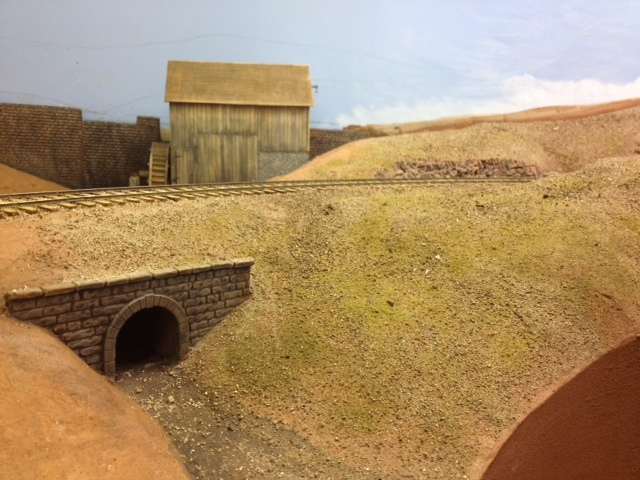 Upon observing the fences on my layout, Gerry commented that in O scale, a fence is a significant scenic element. I always liked adding fences to my N scale layouts, so they are important in all scales, but in O scale they are important scale models in their own right. The small stand of trees will help block the view across the "blob." More soldiers will be marching in this scene. The 5th New York, a zouave unit, was stationed in this area. They have distinctive red and blue uniforms. I plan to add a good number of them to the scene. The redoubt be either painted on the backdrop, or modeled in N or 15mm scale. Gerry came up for a work session Saturday. Ben Hom also tried to attend, but he never made it in the house as no one heard him ring the door bell. Sorry about that Ben. You missed a good session and not one, but two cakes that Gerry brought up from C'ville. Hopefully we can get you over next time. Gerry worked on detailing the Stoneman's Station scene. He added stairs to the freight platform and to the embankment. The ladder in the embankment was based on a similar scene at the prototype Stoneman's. Then Gerry took on the challenge of adding nail holes to the freight platform. He actually liked doing it. The rough frame for the porch roof. I continued work on the tavern. It is just about done except for the sign and some touch up. Gerry brought over an impressive assortment of reference books for additional ideas for out buildings and 19th century vernacular architecture in general. I am looking forward to studying them. We also discussed the ACWRR Road Show. The design in coalescing, but still not finished yet. It is hard to get a good photo of the tavern without the lights or valance showing. Work continues on the tavern to be named later. I cut the windows and doors on the laser and assembled them. Then I added the roof trusses, ridge beam made with laser cut 1/8th inch plywood and roof skin using 0.022 PolyBak. Then I added the fascia and trim along the roof. In a first in a long time, I used 0.040 by 0.040 inch styrene strip to add the final trim pieces to the roof. I haven't use styrene on a model in a long time. Usually I laser cut the trim peices I need to the exact size, but it was quicker in this case to use styrene. Once the roof was enclosed I added laser cut cedar shingles. It's a tedious process, but it does create a nice looking roof. I still need to add the chimneys, porch and foundation. The brick is very convincing. The Taskboard surface has a nice brick texture, not overdone like some other bricks I have seen. It also can be prepainted before laser cutting. That saves me having to try to paint the grout lines. But the laser cutting process makes the individual bricks somewhat fragile. A few will come off in routine handling as you build the structure. So this laser cut brick technique is not really suitable for a commercial kit. With the roof on, I placed the building back in its intended position. I am now reversing myself and leaning to having the building front face the road vice the tracks. Even though the tavern is freelanced, the orientation of the tavern would provide a hint to its history. If it faces the road, it probably pre-dates the railroad. 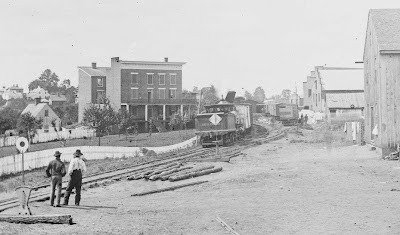 However, if it faces the tracks, perhaps it was built after the railroad to service the passengers using Brooke as a stop to head into northwest Stafford and southern Prince William County. There is also an unexpected practical implication. With the roof on and placed facing the road, I discovered that the building does a good job of blocking the view of across the "blob." ( I suppose it is only half a blob, as the other half is not visible.) In any case, my intent was to use the hill and trees plus the low valance to interrupt the view down the length of the layout. It did not occur to me when I was designing the layout that a building could also help perform that function. This is part of the learning process in switching from primarily N scale to O scale. Buildings and ships are quite large in O scale. It has taken me a while to make that mental calibration, now in the vertical dimension. However, the tavern is further sparking my interest in trying a model of the very large Pioneer Mill and Fitzgerald Warehouses in Alexandria. This un-retouched photo illustrates one of the problems with a low valance and high buildings. This is a good photo angle for capturing the train coming out of the tunnel, but the low valance and the photos in hallway are very visible in the upper left. It will take some photoshop work to remove them when it comes time to do finished photos. Finally I received some good suggestions for the name of the Tavern. Pete Magoun, being an old sailor, suggests "McGuirk's Fouled Anchor." He also suggested the "Old Dominion Inn." Gerry recommend "Uncle Billy's Tavern." Trevor's suggestion involved an artichoke. Another that appealed to me was the Golden Stag or the Goldener Hirsh if I wanted to imply a German owner. While these were interesting, I think something more in line with the locale might be in order. Some ideas that came to me were "Accokeek Inn" and the "Spotswood Tavern." Accokeek is the stream that passes near Brooke. Spotswood is a very old Virginian name. One of the first governors of Virginia was named Spotswood and it was the first name of my brother's college roommate. I am still open for suggestions. Get those creative juices flowing. Three different scale versions compared. I tried three different versions of the tavern, one full O Scale, one in S Scale and then a selectively compressed O scale version. It is the same height, but about 1.5 inches shorter and two inches narrower. The full scale structure won't go to waste. It will get covered with board and batten siding and become one of the warehouses at Aquia Landing. The S scale mock-up may turn up some where too. I then laser engraved and cut the brick overlay using pre-painted task board. That works pretty well, though the bricks are fragile. 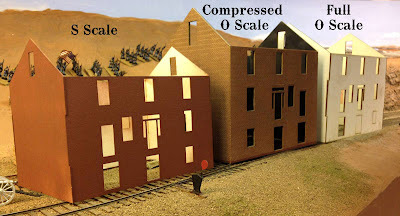 The bricks are scale size, as is the grout line - one of the advantages of O scale compared to smaller scales where bricks sizes are frequently off. The windows and trim are next. I will custom cut them as I did not have any Tichy or Grandt ones in stock that were close. I also need to come up up a spiffy name for this tavern. Any suggestions? The Prancing Pony? The Dew Drop Inn? The Ten Bells? Inspired by this view of a hotel with the porch facing the tracks at Culpepper, VA, I decided to do the same with my tavern. The bottom photo shows the selectively compressed tavern with the porch facing the tracks. I will build up a stone embankment and create a level spot in front of the porch similar to the scene in the Culpepper photo. You can also see a while gabled wall to the right rear of the tavern. That is a mock-up of a full sized O Scale New Hope church. Many of the early, rural Virginia churches didn't look much different than warehouses or barns, without a steeple or impressive facade. Since even this church is so big, I may omit the it from the scene and assume it is just off the layout. Alternatively, a selectively compressed version may work further up the hill. As scenery progresses around the last section of track, I realized I needed to finalize the design at both ends of Brooke siding. My original intent was to depict a saw mill or log splitting operation at the south end of Brooke. 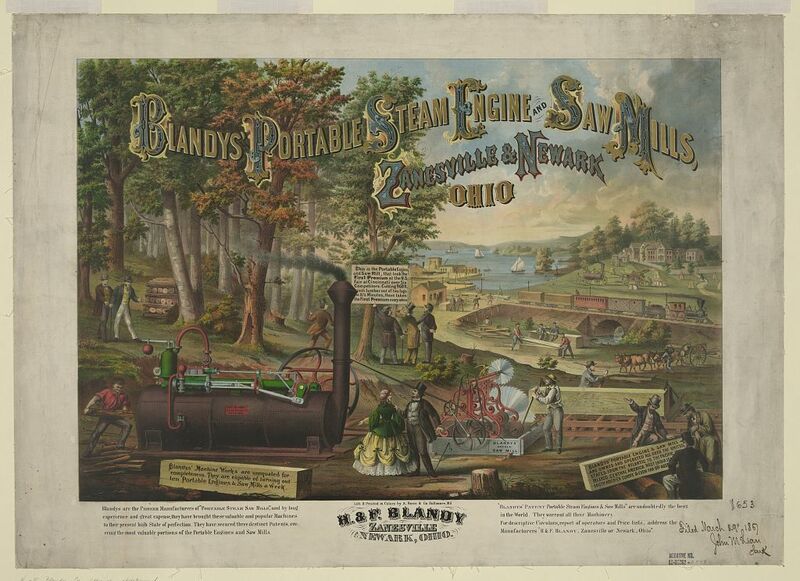 I was inspired by this image depicting a saw mill operation on the USMRR on the City Point line. This photo shows what appears to be a steam powered saw mill on a siding. 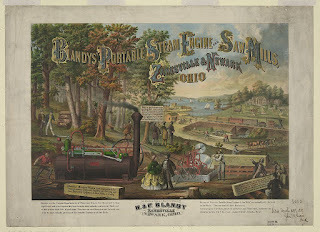 I couldn't tell if it was rail mounted, so my plan was to place it off the tracks, like the mill depicted in the lithograph of the Blandy's Portable Steam Saw Mill. The area on on this mill side would depict a bunch of cut timber waiting for pickup. But I recently saw a photo of a USMRR log splitting operation at Alexandria on several auction sites. I can not find a high resolution version of this image, but the apparatus is clearly mounted on a rail buggy. That means it would need a spur to reside on. The only one I have open at this time is the spur at Brooke. So if I want to include this buggy on the layout, i will need to reconsider how I will place the buildings at Brooke. I had looked at several of the taverns on the HABS/HAER web site and thought that the Crossroads Inn near Charlottesville had the right look. I liked the double deck porch. But this building was too large in full O Scale. I laser cut a couple mock-ups to get a feel for it. I tried an S scale version (too small but ok if placed in the background), then a full O scale version (neat, but too big) and a selectively compressed version that is the full length, but about 30 percent narrower. That seems to work the best. I tried several spots for the tavern, but selected the spot shown in the image below. The upper porch will wrap around the uphill side of the tavern. I used photoshop to draw the other planned buildings - a store in red and the blacksmith in brown in the foreground. There will be a farm house and a few out buildings up on the road toward the background. The USMRR will have their logging operation at the spur, along with a normal supply platform. There will also be the remains of the old RF&P station depicted in the scene. I also want to include a church probably next to the farm house. These background buildings will be sub scale for forced perspective. Good progress on Weilepp's Cut too. Wet glue view showing the mill and footbridge. I recently ordered a copy of Volume 2 of Gordon Gravett's Tree Modeling series from International Hobbies in Auburn, CA. The proprietor says the book will ship to US customers in about 3 weeks. 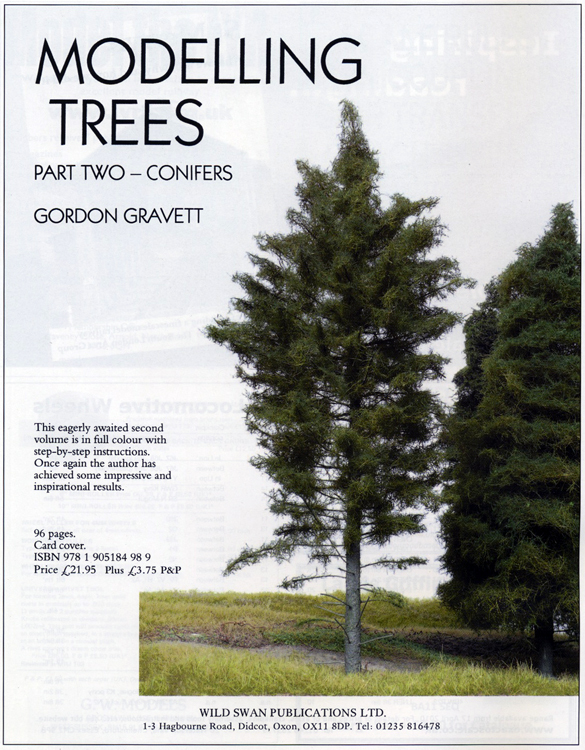 I am eagerly awaiting this volume as accurately modeling the generic southern yellow pine has me stumped. The tree at the left was an attempt to use bumpy chenille to represent the pine needles. I did not like how it turned out. So I am curious to see what Gravett recommends. My fall back position is to use the technique the artisans at the Fisher Museum did in the 1930s with etched pine needle clusters. I did an etch drawing for the pine needle clusters and have it ready to go to the etchers, but I am waiting for this book to see if another alternative is better. If I go with etched needle clusters it will take a good amount of time and money to make a tree, but one could end up with a spectacular model. I think O scale is about as small as one could use the etch needles. The etch material will be 0.002 inches thick while the needles will be about 0.003-0.004 inches wide. That is over scale, but not by that much. So I'm on pines and needles waiting for this book. Craig Bisgeier was back for more punishment tonight. This time local guy Dave Emery came with him. Both of these guys model railroads in the 19th century. I immediately put them to work. Dave got the job of installing a slew of NBWs to the hub of the water wheel. I accidentally had put the NBWs on the side that faces the mill. Even the outward facing ones will be hard to see, but we know they are there. The holes were predrilled, so Dave just had to insert the NBWs. Craig got the job of building the sluice. "Do you have any plans?" he asked. "Plans, no. But I do have a bunch of photos," was my reply. So with the photos and the run of my shop, Craig scratch built the sluice for the mill. It came out great. While they were working I painted the backdrop behind the mill and dam and added a section of split rail fence. After they left, I glued the mill and races in place and weighted it down so the glue could set. The mill scene is really coming out nicely. I am glad I decided to add it. Visitors don't get to see this view. Train's eye view. Still need to finish the scene with fence, footbridge, vegetation, details and figures. Several folks have asked, "How far along is your layout?" The overall answer is about 50 percent. 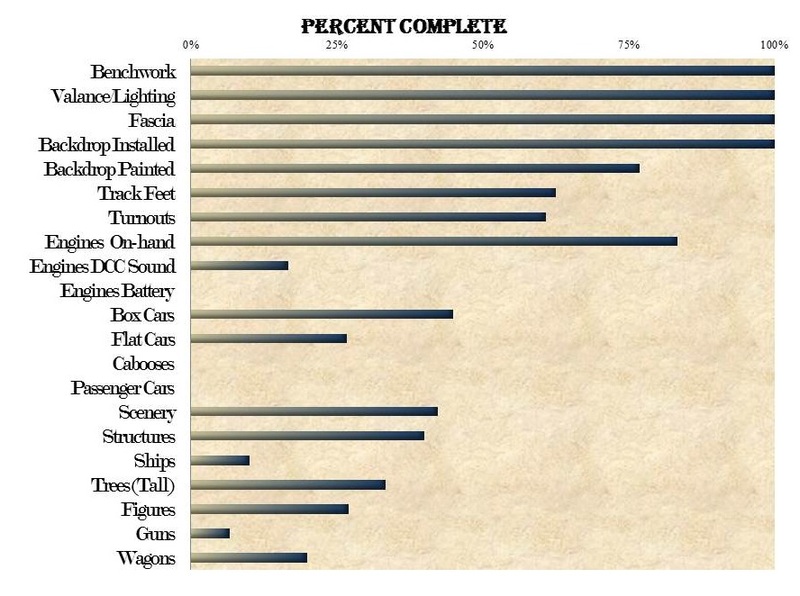 Here is a breakdown by category of task.
" It's all in the wrist action" Craig ballasting track. Craig Bisgeier, of Housatonic Railroad fame, and cohost of Model Railcast stopped by the layout tonight. This was his first visit to the USMRR Aquia Line. As he was willing, I put him to work ballasting track at Brooke. He was able to get all the remaining track ballasted. Once it dries, the adjoining scenery base coat will be installed. With the ballast complete it reminds me how this layout is getting close to a finished state, at least in this area. There still is Aquia Landing to look forward to. While Craig ballasted, I worked on painting the rock outcrops at Weilepp's Cut. I then extended the forest scene on the backdrop on the hill behind the cut. One wire tree temporarily placed to see how it matches the back drop. All-in-all a good night. Craig is in town all week, so hopefully we can hook up again and run some trains. The first rule of Book Club is that nobody talks about Book Club. Wait, that's not right. Oh well. Every few months, it is wive's book club night at Paul Dolkos' house. During these times, Paul finds it expedient to head over to my place to work on the layout or just hang out. So he arrived right after dinner and I had a job ready for him to do. Paul is one of the best ballasters in the hobby. He even wrote an article for Model Railroader on the subject. So I aked him to do some ballasting in the area of Weillep's Cut. I had earlier sifted a large batch of Utah soil for this job. So Paul spread it out and did about 5 feet of track. While he was doing that, I swapped the trucks on car 1224 with new free rolling ones. Now the car runs great. The trucks I used were actually one of the prototype sets I built with home made brake part parts, not the later etched parts. The homemade parts work great. So 1224 is back in action with new trucks and working brakes. The problem with the first set of trucks of 1224 was that the wheels did not roll freely. Turns out the wheel faces were rubbing the inside of the truck side frame. This occurred because I had filed the axle ends to make the axle shorter. I did this to try to make the truck as narrow as possible. Why? Because I am using O standard gauge, my track rail width at 5 scale feet is about 0.07 inches too wide. Standard O Scale axles tend to have a good amount of axle outside the wheel faces. This means that the truck has to be unprototypically wide to accomodate the long axles. When installed under the freight cars, the trucks don't look quite right. So I have been progressively making my trucks narrower as I evolve the design. I also have been trimming the axle length. But in this case, I made the axles too short. Thus they could move around while in their journal and interfere. In the future, I will not modify the axle length, but just design the journal to be a little deeper to accept the longer axles. As a last resort, I may make my cars a little wider so they look like they overhang the trucks appropriately. When Paul was done with his track ballasting, we spent a few minutes looking at the MR 75 year DVD collection. Paul asked me to look up an article from Harold Geisel from the 1940's. Sure enough we found it. Geisel was modeling a Pennsy Branch line in 17/64th inch to one foot scale. Why such an odd scale? It works out to about 1/45th scale and it makes standard O gauge track the correct 4' 8.5 inches. All this mathematical gymnastics and confusion just because of an historical quirk in the original O gauge. The obvious answer is P48 and perhaps when I build my next ACW layout, it will be P48. After Paul left, I took some of the scenic supplies and put a base layer on the hills surrounding the Weilepp's Cut. It is about time to install the mill at Accokeek Creek. The structure is ready, but I need to build the sluice. Base scenery at Weilepp's Cut is still wet. The rocks still need their final paint treatment. tried it. Every one does, including me. This weekend the C&O Historical Society held its 2012 annual meeting at the Hilton Hotel in Alexandria, VA. Even though it was only one mile from my house, I was not able to attend. I have many friends in the C&O Historical Society and I would have liked to hook up with them, but I just couldn't make the schedule fit. Nonetheless, five of them visited my layout on Sunday morning. Ted Pamperin, Dave Olesen, Tony Licese, Gerry Fitzgerald and Bob Tegtmeier (Bob is modeling the LNE but has an interest in the C&O) spent the better part of the day visiting, operating and then running the laser to make a kit. Ted, Dave, Bob and Tony are from New Jersey while Gerry is a regular from Charlottesville, VA. Ted, Dave and Tony are all building steam era layouts depicting the C&O. Link and pin couplers, man are you kidding me! Ted and Dave were good sports and jumped right in to operate the Aquia Line. They ran a train across the layout switching cars and using the turntable. They are experienced operators and were up to speed in no time. They even had fun using the link and pins couplers. Bob, Tony and Gerry also got some throttle time on McCallum. We observed that boxcar 1224 was have trouble derailing when backing. After some debugging we determined that its trucks and wheel sets were binding. I replaced the trucks with new free rolling ones and the car ran fine. I think I need to move the cast metal truck project to the front burner so I can refit some of the fleet with new trucks. Ted demonstrated his 3D video camera. That was a cool toy. I may have to get one of them. It really worked well. The drawback is you need a 3D TV to view the videos. After the op session, we fired up the laser and worked on making an HO scale model of the Alleghany depot. I had previously built a model of this structure in S scale for a custom client. So today we converted it to HO and cut three kits. It took a good amount to effort to do it, but with Ted, Dave and Tony's support and encouragement, we nearly got it completely finished. One more night with the laser and the parts will be ready. This had been a task on my do list for some time, so it was good to bang it out. If there is interest, I may make this an Alkem Scale Models kit. Gerry stuck around for dinner. Afterwards, we had some more discussions about the ACW Road show. We think we are converging on a design We will probably opt for something simple but we are still in the design phase. More on that later. I made about 50 O Scale tons worth of hardtack boxes today. Fifty tons of hardtack (Army bread) is about one quarter of the daily requirement for the Army of the Potomac in winter quarters. Each box hold 50 pounds of bread. So a stack 4 by 5 by 6 is 3 tons. These boxes are the Mark II version. I had earlier made a large number of bread boxes using laser cut one-quarter inch aspen wood. These looked OK, even though the grain on the boxes was not correct, especially the end grain and the sides had a noticeable draft angle. The Mark II versions use a laser cut 1/8-inch plywood core with laser engraved and cut cedar veneer on the surface. The Mark II design builds up quickly and makes a nice stack. I may try some basswood later, as the grain on the cedar is fairly pronounced. I made stacks 4 by 5 by 6, but they can stack on top of each other. Prototype photos show these stacks 16 boxes high. I also made some single and double boxes for miscellaneous detailing. Two hundred twenty new boxes at the Falmouth Depot. No, not that kind of spike! However, while we are at it congratulations are due to Kerri and Misty for their third Olympic Gold. This is the kind of spike I meant. Over the past few weeks I have been driving spikes for 30 minutes to an hour each night. Tonight I finished all the spikes in the main room. There still is more spiking to do at Aquia, but that won't be for a while. I also did some more scenery work between Stoneman's Station and Potomac Creek. The layout here is a narrow shelf. There is a long stretch where an open field abuts the backdrop. At first I tried using grass and scenic material to disguise this interface. But upon reflection, I decided to add a fence to visually minimize it. I went with a worm type fence. At first I built it full size, but I decided to remove a few rails to make it appear further away and force the perspective. I also added more layers of ground texture including some stumps, grass, ground leaves, twigs, and a few cedars. A lone picket stands behind the reduced height fence. He is a 28mm Renegade figure. A train head north from Stoneman's past the new scenery. Having completed a batch of trees, it was time to install some of them. I had planned a small stand of trees at the north end of Stonemans Station. After I had mocked up the scene, I decided that the backdrop needed to be augmented with some more trees. This extends the scene in depth and makes the foreground trees look more detailed than the really are as it is hard to tell the modeled branches from the branches painted on the backdrop. I installed three of the wire trees along with several smaller weeds and crepe mrytle twigs to simulate younger trees. The single tree in the foreground is a wire tree. Since it is near a switch stand I expect it to take a bang every now and then. Hopefully the wire tree will hold up under that abuse.